Sasa borealis (Hack.) Makino, a clonal dwarf bamboo, is widespread in Korean forests. Although S. borealis is native to that country, its growth habit can cause considerable harm when occupying particular areas where it dominates and influences those forested communities. However, few reports have described the extent of its inhibitory effects on the vigor of co-existing plant species. Therefore, we investigated the distribution, abundance, and diversity of other plant species in the communities where this plant occurs in the east-central forests on the Korean Peninsula. S. borealis was most commonly found at an elevational range of 800 to 1,200 m, on gentle, usually lower, and near valley northern slopes. Out of the 13 forest communities based on 447 forest stands that we surveyed, S. borealis was detected in eight communities, mostly where Quercus mongolica dominates. In particular, it was more common in late-successional mixed stands of Q. mongolica, other deciduous species, and the coniferous Abies holophylla. Because of their ability to expand rapidly in the forest, this plant covered more than 50% of the surface in most of our research plots. Species diversity declined significantly (F = 78.7, p = 0.000) as the abundance of S. borealis increased in the herb stratum. The same trend was noted for the total number of species (F = 18.1, p = 0.000) and species evenness (F = 91.5, p = 0.000). These findings clearly demonstrate that S. borealis is a weed pest and severely hinders species diversity. Authorities should be implementing various measures for ecological control to take advantage of declining chance after the recent synchronized massive flowering of S. borealis. Sasa borealis (Hack.) Makino is a native plant species that belongs to Bambusoideae. It can be found on almost any mountain in Korea, including national parks (Lee and Lim 2002), and has been reported from the southern to the northern regions, e.g., Mts. Baegun, Wolchul, Jiri, Naejang, Deogyu, Sobaek, Chiak, Odae, and Seorak (Ahn et al. 2004; Oh et al. 2005; Choung et al. 2009; Kim 2012; Park et al. 2012; Cerny et al. 2013). Although three other species of Sasa—S. kurilensis, S. quelpaertensis, and S. coreana—grow in Korea, their populations are isolated and found only on Ulleung Island, Jeju Island, and in North Korea, respectively (Lee 2003). This evergreen dwarf bamboo shows a clonal habit. Once established, the plants annually produce new ramets (culms) on their long, thin rhizomes (Makita 1998) and grow approximately 1 to 2 m tall. Because of the physiological integration between connected rhizomes, they can overcome resource deficiencies (Saitoh et al. 2002). In addition, their very shade-tolerant nature means that they can occupy the forest floor and become dominant as their populations increase infinitely (Yuruki et al. 1987; Park et al. 2012). Consequently, the density of aboveground evergreen shoots is high throughout the year while their thick, round rhizomes completely also occupy the underground space. These attributes make the plants very competitive within the lower strata of a forest, and pure patches can be maintained for long periods (Oshima 1961; Nakashizuka 1988; Hiura et al. 1996; Narukawa and Yamamoto 2002). In Japan, plants within the Sasa genus are regarded as serious weed pests (Li et al. 1992). In the 1950s, the Japanese Forestry Research Institute reported that approximately 50% of the area in Japanese national parks was covered with these plants, and that they accounted for 90% of the coverage in Hokkaido (Oshima 1961). On Jeju Island in Korea, S. quelpaertensis covers approximately 76% of the northern slopes at Mt. Halla National Park, from 400 m up to the top. These circumstances are especially threatening to the survival of rare plant species such as Empetrum nigrum var. japonicum, Gentiana chosenica, Primula modesta var. hannasanensis, and Ranunculus borealis in subalpine zones (Northeastern Asia Biodiversity Institute 2017). The current massive flowering cycle for S. borealis began nationwide in 2013 (Cho et al. 2017). As a typical monocarpic plant, culms in the flowering patches tend to die off within 1 year. Therefore, this type of reproductive event has an enormous effect on the vegetation dynamics of a forest dominated and suppressed by Sasa. Although it may be too early to determine whether this event enables other species to regenerate naturally or allows S. borealis to re-populate a site, this phenomenon gives us the opportunity to investigate whether a species that normally inhibits diversity in South Korean forests might also experience its own natural decline on such a large spatial scale. In Korea, the Act on the Conservation and Use of Biological Diversity has been enacted to preserve and protect biodiversity by designating some plants, including invasive aliens, as ecosystem-disturbing species (Ministry of Environment 2017). Although S. borealis is native to that country, we believe that its growth habit can cause considerable harm when occupying particular areas where it dominates and influences those forested communities. Under such conditions, the diversity of other plant species appears to be very low. However, these scenarios have not yet been officially documented or quantified in Korea. Our research goals were to explore the physical habitats and forest communities in which S. borealis occurs and to determine how plant species diversity is affected by the dominance of this species. These findings could then be used to develop strategies for ecological control and manipulation. We used a database incorporating information that we had gathered previously in our National Ecosystem Survey for the Ministry of Environment (Choung et al. 1997, 1998; Choung and Oh 1999; Choung and Hong 2001; Choung et al. 2002, 2003; Choung and Lee 2012; Choung and Kim 2013), plus data collected for Korea Long-term Ecological Research (Choung et al. 2013) and the Survey on Natural Resources in Korean National Parks (Choung et al. 2004). Those studies of 447 forested plots in the east-central portion of the Korean Peninsula focused on the period of 1992 to 2014 and covered most of Gangwon Province and part of Chungcheong Province, including Danyang and Jecheon. 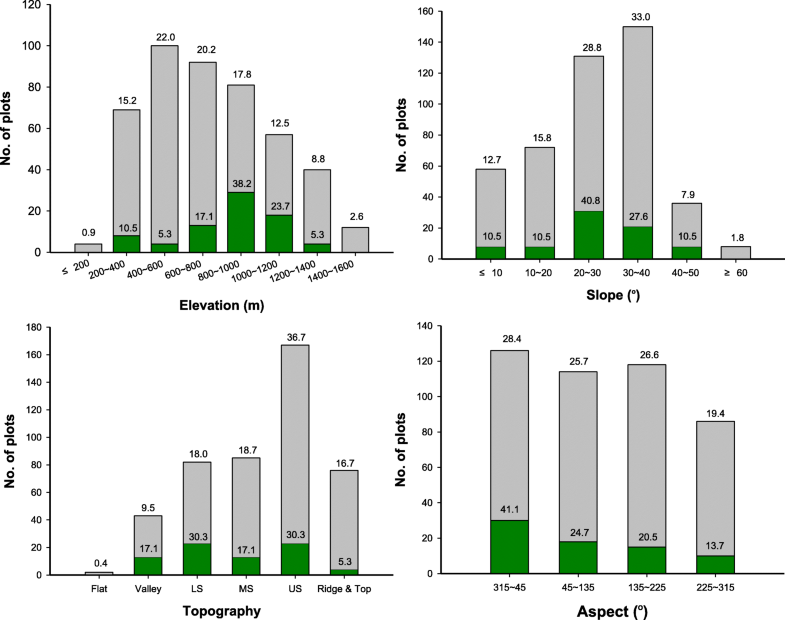 Four variables were examined as potential factors in determining the establishment and spread of S. borealis: elevation, slope, topography, and aspect. The abundance of all plant species in each plot was analyzed by the Braun-Blanquet dominance scale for each of four strata, based on plant height: (1) tree (T1), > 8 m tall; subtree (T2), 5∼8 m; shrub (S), 1∼5 m; and herb (H), < 1 m. The number of plots where S. borealis presented was 76 with either 15 m × 15 m (46) or 20 m × 20 m (30). We first conducted a cluster analysis to classify vegetation types, using cover data transformed by the square-root arcsign (Peck 2016) and then determined the frequency and abundance of S. borealis within communities. Those communities were named according to the one or two dominant tree species (cover > 50%) and other species that were deemed to be significant indicators, as revealed by an analysis by Peck (2016). From our 447 plots, 642 taxa were identified (Lee 2015). Species diversity was evaluated by stratum, and S. borealis abundance (% cover) was assessed within the herbaceous stratum. For species diversity using the same size 46 plots (15 m × 15 m each), we applied the Shannon-Weiner index (H′ = − ∑ p i loge p i ), where p i represented relative cover. Species evenness (E) was calculated as E = H′/loge S (S number of species), while species richness was defined as the number of individual species on a plot. The growth form was recorded for each species, as we have previously described (Choung et al. 2012). For this, the categories of tree, shrub, and herb respectively included trees and subtrees; shrubs, vines, prostrate woody plants, and subshrubs; and herbs and climbing herbs. Differences among plots and strata were examined by one-way ANOVA, followed by a Bonferroni post hoc analysis. Regression analysis was used to investigate the responses of diversity indices based on S. borealis coverage. All data were examined with SPSS software (SPSS 2013; ver. 22). The most common habitats for Sasa borealis were determined by examining site conditions (Fig. 1). Our plot surveys revealed plants of that species on 76 of 447 plots. This species was less likely to occur in the elevational classes of lowlands (100 to 240 m) and highlands (1,360 to 1,555 m) and was more common (61.9% of all plots) at elevations of 800 to 1,200 m.
Plants of S. borealis preferred more gentle slopes, i.e., 0° to 47°, and were not found in steeper areas. In particular, this species was most frequently counted (40.8%) on slopes ranging from 20° to 30°, followed by 30° to 40° (33% of all plots where it occurred). Overall, these plants tended to be more common, topologically, on near valleys and lower slopes (61.6%) and were less frequent on ridges and mountain tops. With regard to the aspect variable, S. borealis was more common on northern slopes (315°~45°) and relatively less frequent on southern and western slopes. Of the 76 plots containing S. borealis, those plants covered more than half of the surface on 58% of those plots. This high spread value was rare for species found in the herbaceous layer in general. Because of its clonal habit, the average coverage and standard deviation for plots with S. borealis were 53.3 and 31.7, and abundance did not differ significantly among classes for any of the four variables (Table 1). The 447 plots were classified into 13 communities (dominant—dominant_other significant indicator species): Quercus variabilis—Pinus densiflora_Ulmus macrocarpa, Q. variabilis—Q. dentata_Spodiopogon sibiricus, P. densiflora—Q. variabilis_Q. serrata, P. densiflora_Rhododendron mucronulatum, P. densiflora_Rubus crataegifolius, P. densiflora—Juglans mandshurica_Persicaria filiformis, Q. mongolica—Carpinus laxiflora_Lindera obtusiloba, Q. mongolica_Syneilesis palmata, Q. mongolica_R. schlippenbachii, Q. mongolica—Abies holophylla_S. borealis, Q. mongolica_Lychnis cognata, Q. mongolica—Fraxinus mandshurica_Philadelphus schrenckii, and Q. mongolica—Betula ermanii_Cacalia praetermissa. Of these 13, S. borealis appeared within eight of them (Fig. 2). Except for the P. densiflora—Q. variabilis_Q. serrata community (no. 3 in Fig. 2), Quercus mongolica was the dominant species, occurring on 96% of all plots. The highest coverage by S. borealis, 61%, was measured in the Q. mongolica—Abies holophylla_S. borealis community (no. 10 in Fig. 2, right side). That particular community is considered relatively late-successional (Lee 2015), where Q. mongolica co-dominates with Tilia amurensis, Abies holophylla, and Acer pseudosieboldianum. In addition to several other tree species, its tree stratum or the shrub stratum in this community is occupied by Rhododendron shillipenbachi and Lindera obtusiloba. Among the eight communities in which S. borealis grows, that species covered more than 50% of the forest floor in five of them (Fig. 2). For the remaining three communities, lower overall coverage by those plants was due to less amenable site conditions, including a lower elevation, an upper slope facing south (no. 8), an upper slope or ridge at high elevation (nos. 11 and 13), or the purity of the Q. mongolica stands that precluded competition from other species. At the plot level, values for species diversity declined significantly (F = 78.7, p = 0.000) as the abundance of S. borealis increased in the herb stratum (Fig. 3). The same trend was noted for the total number of species (F = 18.1, p = 0.000) and species evenness (F = 91.5, p = 0.000). This was especially true when S. borealis covered more than 75% of the surface in a plot. In that case, the diversity index for the herb stratum was as low as 0.536, which then limited the availability of water and nutrients to plants in the canopy. However, diversity within the tree, subtree, and shrub strata did not tend to be correlated with the dominance of S. borealis. Although the diversity of shrub species tended to decrease as the frequency of S. borealis rose, this trend was not statistically significant and possibly resulted, instead, because of the limited sample size. In the herb stratum, H′ values for herbaceous species were significantly reduced as the abundance of S. borealis increased (F = 45.8, p = 0.000; Table 2). When coverage by that species was > 75%, the diversity index in such plots was as low as 0.314. In particular, the number of herbaceous species averaged 31 when S. borealis abundance was < 5% but totaled only six when Sasa coverage was > 75% (F = 45.8, p = 0.000). Similar trends were noted for species evenness and total number of species (F = 65.8, p = 0.000). The species diversity of tree and shrub species in the herb stratum also tended to be lower, but those differences were not significant due to the small sample size. Populations of Sasa borealis are most frequent and abundant at the mid-elevations, i.e., 800 to 1,200 m, and plants favor gentle slopes near valleys and lower slopes. They also show a preference for a northern rather than a southern aspect, probably because the former is relatively moist (Lee et al. 1996). Kong (2001) has shown that this species tends to grow better at higher elevations because winter snows provide protection against cold, dry conditions. On Mt. Jiri, this species appears in patches that occupy large areas of slopes, ranging from lower valleys to mountain tops. The same observations have been reported by Ji and Park (2008) and Park (2013). Jang et al. (2012) have suggested that the distribution of S. borealis is similar to that of Q. mongolica because the former can appear in various types of forests that are always dominated by the latter. Furthermore, S. borealis occurs more frequently in late-successional mixed stands of Q. mongolica—Abies holophylla that are located on moist, gentle slopes. Once S. borealis has become established on a site, it will remain very abundant regardless of environmental conditions or the species of trees with which it is associated. Therefore, this scenario can influence forest dynamics, including regeneration, for at least several decades (Makita 1998). In Japan, S. kurilensis dominates beech (Fagus crenata) forests and probably has a strong effect on beech regeneration because thick coverage by S. kurilensis prevents the beech seedlings from rooting firmly in the forest floor. Cerny et al. (2013) have shown that S. borealis inhibits species diversity in Korean national parks. Our current findings support that conclusion. For example, we found that species diversity within the herb stratum is significantly reduced as the abundance of S. borealis increases. Moreover, the extent of species diversity is lower for herbaceous plants than for any of the other growth forms recorded near the forest floor. The greater contributors to species diversity in forests are herbaceous plants. On the Korean Peninsula, approximately 77% of the 4,050 plant taxa are herbaceous (Choung et al. 2015). Park et al. (2012) have reported that the number of understory plant species and the biodiversity index are low on Mt. Jiri, a region where the coverage by S. borealis is > 90%. We believe that S. borealis inhibits the establishment of canopy tree species. 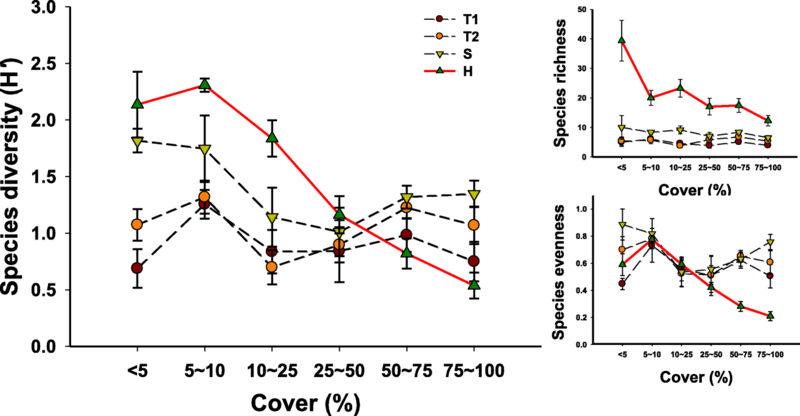 Species richness also declines as the shoot height of S. kurilensis increases (Kudo et al. 2011). Kim (2009) has determined that species diversity decreases as the density of S. quelpaertensis populations increases in shrubby areas of Jeju Island. Although it might be difficult to explain how Sasa hinders plant species diversity, certainly its monopolizing of physical space and resources is a key factor. As an evergreen plant, members of this genus block light from reaching the forest floor throughout the year (Kudo et al. 2011; Park et al. 2012). Researchers have also suggested that S. quelpaertensis (Kim et al. 2007) and S. cernua (Li et al. 1992) have allelopathic effects on their competitors. Furthermore, patches of Sasa can provide habitat for small mammals, who might consume larger seeds and indirectly prevent the regeneration of trees (Abe et al. 2001). Historically, S. borealis had been widely used in the production of mats, baskets, and “Jori” a type of strainer that separates soil particles from the grains when cooking rice. In fact, Jori was used in this manner during the Joseon Dynasty, as recorded in “Imwon Gyeongjeji” (Agricultural Economy) (Chung 2012), but might date back even further because rice has been eaten in Korea since the Three States period, which was much earlier than the Joseon Dynasty. However, automation replaced Jori in the 1970s. Since then, plants of S. borealis have not been harvested for Jori but instead have invaded nearby abandoned or disturbed fields and forests. Simultaneously, those forests have been disrupted by logging and slash-and-burn farming practices, resulting in huge open areas that are vulnerable to expansion by this weedy species (Lee 2010). On Jeju Island, authorities are implementing various measures, e.g., horse grazing and cutting, to restore the level of plant species diversity that has been diminished by the presence of S. quelpaertensis (Northeastern Asia Biodiversity Institute 2017). In forests on the mainland, including Korean national parks, S. borealis dominates large portions of the herb stratum where Q. mongolica is the most prevalent tree species. Its impact is enormous not only for species diversity but also for forest dynamics. Therefore, designating such invader as ‘Disturbing Species’ should be seriously considered. The most recent rare, nationwide event of synchronized massive flowering by this species peaked in 2015 (Cho et al. 2017). Taking advantage of the fact that the culms of S. borealis decline immediately after flowering, managers should quickly take the opportunity to implement methods of ecological control to restore biodiversity in Korean forests. We explored the physical habitats and forest communities in which S. borealis occurs and determined the dominance of this species on other plants. It was found commonly at mid-elevational ranges, on gentle, usually lower, and near valley northern slopes. This plant covered more than 50% of the surface mostly where Q. mongolica dominates, particularly in late-successional mixed stands of Q. mongolica, other deciduous species, and the coniferous Abies holophylla. Species diversity declined significantly as the abundance of S. borealis increased in the herb stratum. The same trend was noted for the species richness and species evenness. These findings clearly demonstrate that S. borealis is a weed pest and severely hinders species diversity. Authorities should be implementing various measures for ecological control to take advantage of declining chance after the recent synchronized massive flowering of S. borealis. This study was supported by Basic Science Research Program through the National Research Foundation of Korea (NRF) funded by the Ministry of Education (C1013696-01-01), Korea Ministry of Environment and National Institute of Ecology as National Long-Term Ecological Research Project (NIE-Strategy Research-2017-02), and 2016 Research Grant from Kangwon National University (D1000654-01-01). SC analyzed the data and wrote the manuscript draft; KL built up the database and performed the community analysis; YC planned and revised the manuscript. All the authors approved the manuscript.